Born in Germany, Tobias Reifland discovered his passion for the viola at an early age and started taking viola lessons at age seven. His past teachers have included Samuel Mateescu, James Creitz, and Lawrence Power. 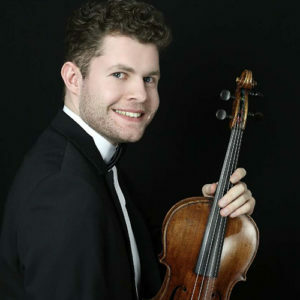 Since 2015, Mr. Reifland has been studying with Roland Glassl at the Hochschule für Musik und Darstellende Künste Frankfurt, and has won prizes at national and international competitions including first prizes at the 2016 International Anton Rubinstein Competition and the 2017 Hindemith Competition, as well as the second prize at the 2016 International Johannes Brahms Competition in Austria. Mr. Reifland has participated in master classes with world-renowned artists such as Tabea Zimmermann, Maxim Rysanov, Bruno Giuranna, Nobuko Imai, and Ettore Causa. He has also been invited to several internationally-renowned festivals, including the Aurora Chamber Music Festival in Sweden, Menuhin Festival Gstaad, and Verbier Festival in Switzerland. As a soloist, Mr. Reifland has performed with the Arcata Chamber Orchestra Stuttgart, German Philharmonic Orchestra Rhineland‐Palatinate, and Philharmonic Orchestra of Bad Reichenhall.